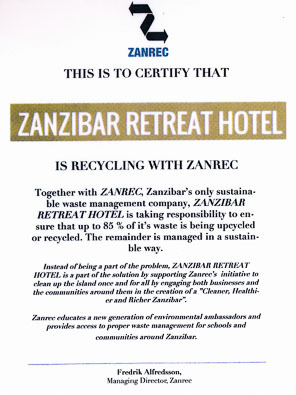 Since 2014 Zanzibar Retreat Hotel has been a major sponsor and supporter of the environment movement ”Together Cleaning Zanzibar” which not only is beneficial to us but to the whole Matemwe. Besides taking care of our garbage and teaching about environmental friendly practices, we also actively support the awareness raising activities in the village executed by Zanrec. By involving everybody, from local communities to private and public sectors, Zanrec empower all people on the island to contribute towards a clean island. Since the activities started we have seen a huge decrease of plastic litter and trash on the beach and in the village. We up-cycle and re-cycle 85% of our garbage and some of the items made from this is sold in our small shop in the hotel. We encourage you to donate a small amount to this important and sustainability effort for a cleaner environment. 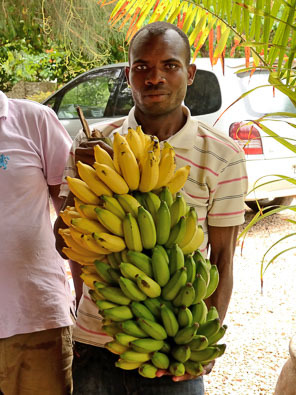 We have always been supporting the local people in Matemwe in different ways. Dada women’s cooperation who makes high quality hygiene articles, toiletries and food products, Wakina mama basket making group who sell to us for hotel usage, and also exhibit in our shop, as well as local artisans. All what we need comes through the village business people selling us local made products such as fruit, coconuts, egg and all drinking water and soft drinks are purchased here, as well as items from town. Of course the fresh fish and seafood. Local craftsmen as carpenters, bricklayers, roof makers and tailors are used as much as possible. Local taxi companies are used for all transfer and activities. The school in Matemwe is another long lasting partner of ours that we support with school materials and where we regularly go with guests. As in all places all over the world, there are football teams, we activetly support one local team in Matemwe.